St Bede’s Old Boy and Bishop of Christchurch, Rev Barry Jones today led a ceremony to deconsecrate the St Bede’s College Chapel. It’s deconsecration and eventual removal is a huge disappointment to the College community and is a result of the Christchurch earthquakes. The chapel has been closed since May 6, 2011, and while remaining earthquake prone, it was hoped that a building assessment and possible repair might spare the sacred space. In a statement on the college’s website, rector, Mr Justin Boyle described it as ‘disappointing’ to loose the use of something as sacred and integral to the catholic school. As well as being the focus of the school’s spiritual life the St Bede’s College Chapel was a convenient size for wedding ceremonies of many old boys. Located in the centre of the College, the chapel was the oldest building at St Bede’s. In 1990 it was extensively altered to allow greater scope for modern liturgies. 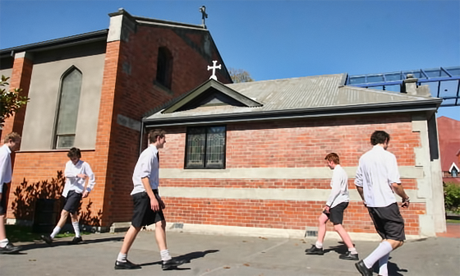 The cost of replacing the chapel is estimated to be $4.7m, meanwhile colleges Masses continue in the school’s Performing Arts Centre. The chapel is not the only building to be affected by earthquake damage and in tough economic times, the College is reaching out to the community. A preliminary estimate of the cost of replacing damaged buildings and or repairing earthquake prone buildings is $20m.